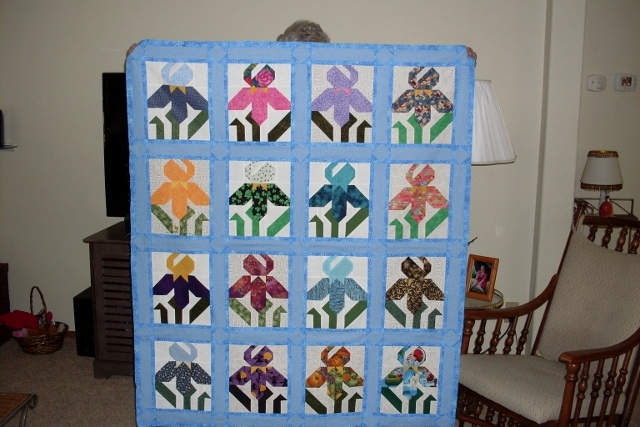 Thread: Iris Flower Garden Quilt top. I just finished putting together this Iris Garden quilt top for a dear friend of mine & wanted to share it with everyone today. Soon I will be sending it to be quilted. When I get it back I will post the finished product. ENJOY!! If you see someone without a SMILE, please give them one of yours!! That is the first pieced Iris block top I've seen. It's lovely! Oh my--that is so pretty! I love the colors you chose. And like Tartan, I've never seen pieced irises. Love it. Absolutely beautiful work. This pattern is new to me, also. Beautiful! I love irises and yours are wonderful! Will be looking for the picture of the finished quilt! Great job! What a beautiful quilt! So unique and modern!!!!!!! Can't wait to see it all quilted! I love your beautiful quilt. You do such good work. Very pretty! Love the colors you chose for the flowers. I love the many different colors you used for the iris. could you share the name of this pattern and its source? How pretty! I haven't seen that pattern before, and you did a beautiful job with it! It is so lovely! Wonderful choice of fabrics for each Iris. Look forward to seeing it quilted! Very pretty! Can't wait to see it when it's quilted. Where did you find this pattern? Beautiful, Sulabug. She will love it. Oh Cheryl! You've outdone yourself! This has turned out just gorgeous!! Oh!!! SulaBug, you did a wonderful job!! I love Irises. Love it, love it. I'm such an iris person.